Pro-democracy lawmaker Leung Kwok-hung throws a defaced mask with a long nose, depicting Hong Kong's Chief Executive Leung Chun-ying as a liar, towards Chun-ying as he attends his first question-and-answer session at the Legislative Council in Hong Kong on July 16, 2012. 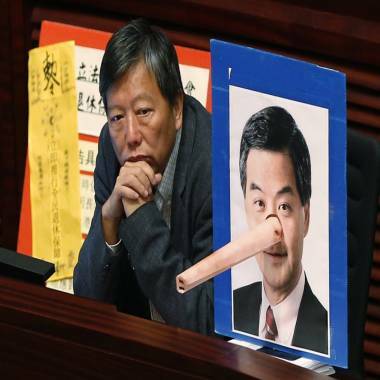 Legislative Council member Lee Cheuk-yan sits next to a picture of Chief Executive Leung Chun-ying with a Pinocchio nose during Leung Chun-ying's question-and-answer session on July 16, 2012. Reuters reports — Hong Kong's embattled new leader, Leung Chun-ying, announced a series of welfare measures on Monday and pleaded for time to deal with scandals that have rocked the city, including illegal structures in his own home. 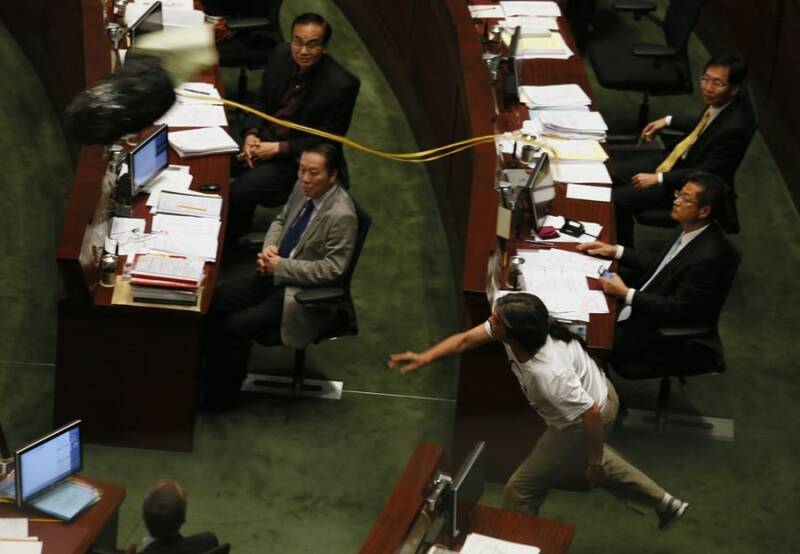 As Leung spoke in the legislature, maverick activist lawmaker "Long Hair" Leung Kwok-hung hurled an effigy of Pinnochio, the cartoon character prone to telling lies, at the new leader, missing him by a few meters. The chief executive, the third person to lead Hong Kong since it returned to Chinese rule in 1997, was unfazed, maintaining a stoic expression throughout the 90-minute session. Read the full story. 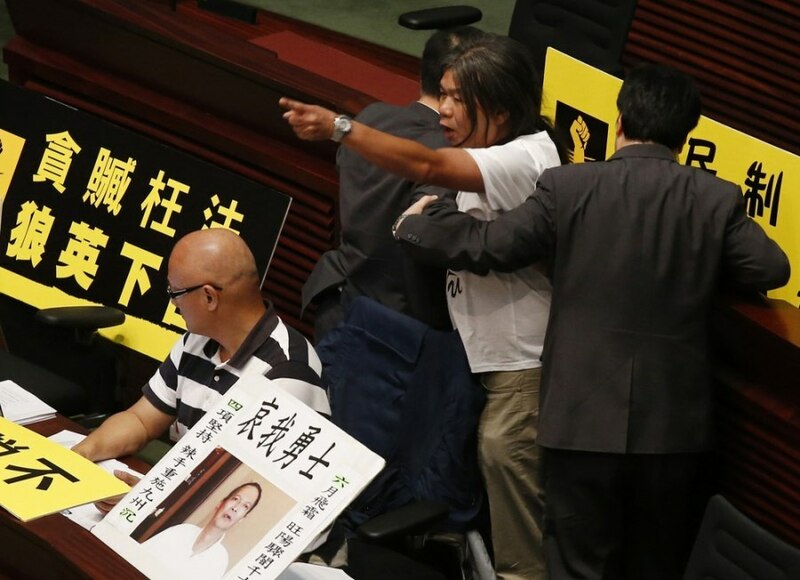 Leung Kwok-hung, also known as Long Hair, second from right, is taken away by security officers after throwing the effigy. A placard near Leung shows a picture of China's late activist Li Wangyang who died June following his release from a two-decade of imprisonment, and reads: "Mourning my warrior."